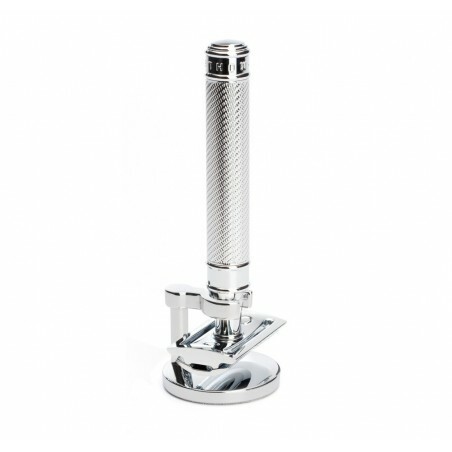 Mühle Traditional Shaving Set R89 Safety Razor & Stand. A 2 piece traditional shaving set with razor handle made of metal with chrome-plated metal materials. Mühle Safety Razor R89 close comb. 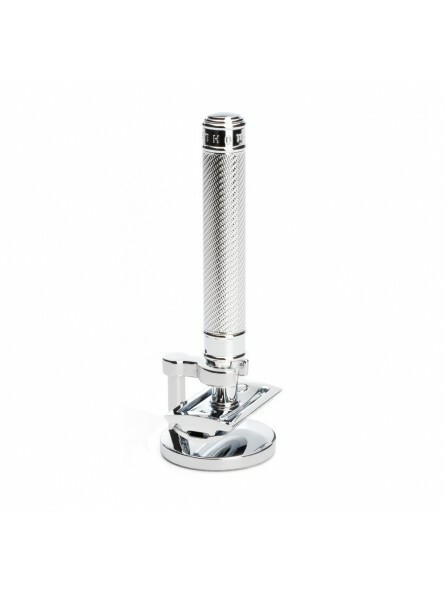 The traditional safety razor with replaceable blade is regarded by many as the first mechanical razor for self-shaving. At MÜHLE it is more: a minor miracle of precision, ergonomics and beauty, created for ambitious wet shavers. Our design combines high-quality metal-working (chrome-plating) with an extremely fine engraved finish. The model comes in two versions (closed and open comb) as every beard growth, every type of facial skin is individual – and the same applies to personal shaving preferences. Comes with a short instruction and one blade. Chrome plated stand made of metal.